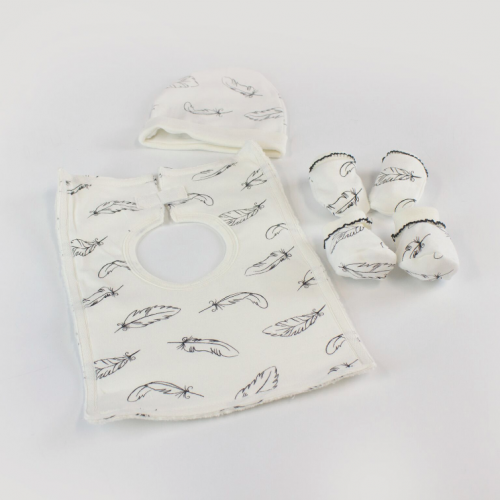 This Newborn Gift Set includes a beanie, booties, mittens and a bib. Made from natural and soft Organic cotton, this essential newborn accessory makes a luxurious and cosy addition to any nursery wardrobe. Perfect for taking your new baby home for the first time. Available in 'Feathers' print, features beautiful and delicate picot edging in matching colour. 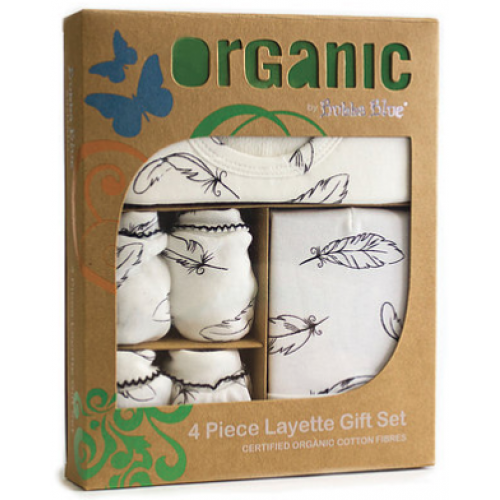 Made from totally natural certified organic fibres, our Organic cotton is naturally soft and grown without the use of toxic chemicals. Perfect for chemically sensitive and allergy sufferers. Cold gentle machine wash separately before use. Do not bleach. Cold rinse. Do not tumble dry. Do not iron print or trims.